Ask the folks at the Chicago CVS on State and Division about my obsession with tape. They probably thought I was running some sort of meth lab with tape fumes or like keeping someone hostage taped to the wall. I'd probably buy a roll or two a visit. For realz – I use a lot of tape. So of course I became naturally became obsessed when I saw Rebecca Ward’s work. This fab artist creates crazy, vivid illustrations and displays with colorful tape. 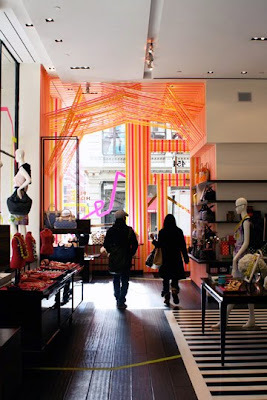 My favorite of her displays was located in the Kate Spade store in SoHo. I mean how crazy good is Rebecca at lining up the tape perfectly! 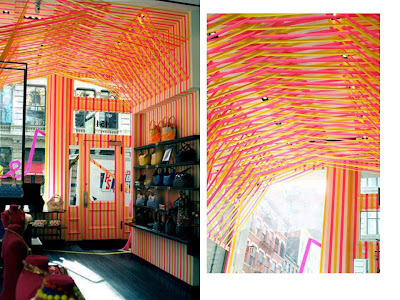 This just sends my head spinning with potential party decor using tape!